Little is known about the history of one of the most magnificent wreck dives in the Straits of Juan de Fuca. A large Manitowac pedestal crane rests on the bottom of the current swept strait, providing refuge for an amazing multitude of marine creatures. The members of the 130' boom and "A" frame are completely covered with brilliant sponges (and the nudibranchs that eat them). 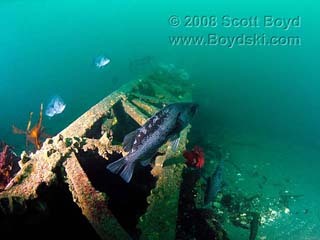 Wolf eels peer out from the engine room and hide amongst the hoist spools. 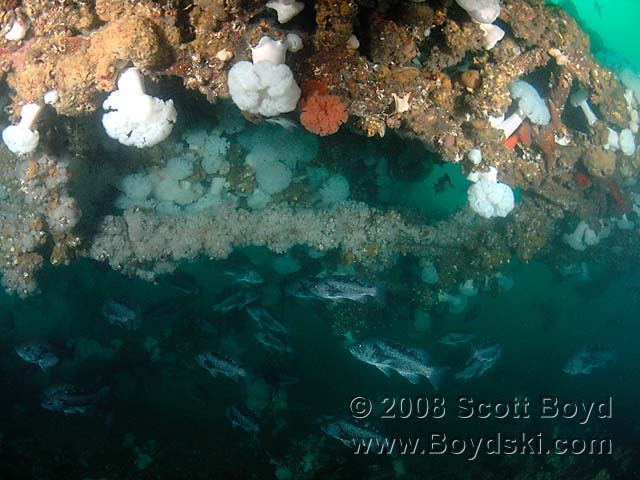 Large schools of pregnant rockfish hide below the main boom and inside the engine house, which is simply massive. Several species of kelp greenlings are startled by the approach of noisy divers and scurry off, only to circle back in curiosity. If you have any information about the history of this crane, please contact Scott. I'll be happy to credit you with the research. The base of the crane, which once was attached to a pedestal on a crane barge or self-loading log barge, dwarfs the bubbling divers that swim by and marvel at this wreck. The fastline jib and sheaves are still in place, waiting to pick up their next load of cargo. 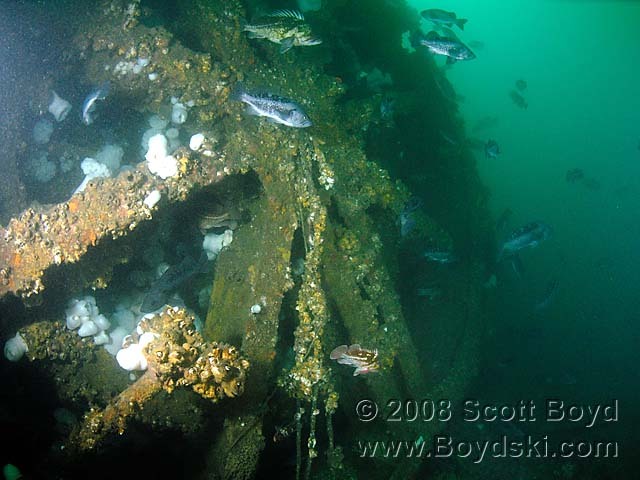 The control cabin is so overgrown with sponges and giant barnacles that very few divers will recognize its function, but it is still there, as are the boom pendants and blocks. Diving the crane requires a bit of gumption. 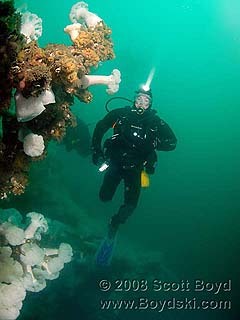 It lies in a very current swept area, not far from the wreck of the Diamond Knot. Even on minimal exchanges that are predicted to be zero, we've been blown off this wreck more than once. However, when the howling currents do calm down, it is an absolutely gorgeous dive that is not only covered with marine life, but one of my all time favorites. The depth of the crane wreck (and its allure) make it very easy to spend a little too long at depth, putting less experienced divers into unplanned decompression. Plan your dives carefully, carry a large surface marker buoy deployable from depth, and keep your eye on the current. Flapping in the howling currents like a flag in a gale for your deco stops is just not a lot of fun. Current Corrections: Do NOT dive this site during anything resembling a Flood Current. The water coming in from the ocean accelerates as it passes over the shallow bar created by the Dungeness Spit and is just ripping as soon as the flood tide begins. This ripping 3 - 5 kt current will last the full six hours of the flood exchange (don't ask me how I know this). Plan your dive for a very small exchange, entering the water about 30 minutes after Slack before Ebb at the New Dungeness Light, 2.8 miles NNE current station. You should have a pleasant dive with minimal current for about 90 minutes before it picks up and starts howling once again. 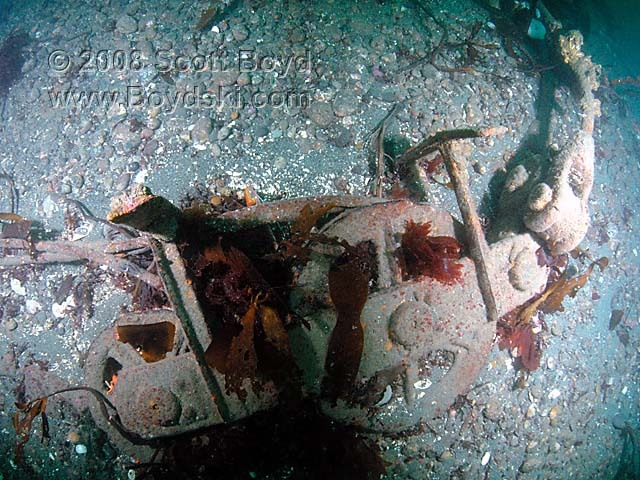 More information about diving this splendid wreck as well as its specific location can be found in Northwest Wreck Dives.